I realize that the thought of consuming hot broth at this point of the season is less than pleasant–but hear me out. Bone broth is the most powerful beautifying “supplement” out there. Loaded with minerals and collagen, this super easy liquid (or gelatin if made correctly and chilled), has the ability to repair digestive issues like “leaky gut syndrome” and those who suffer from things like constipation, diarrhea, and Crohn’s Disease. So, how is it that a soup made from simmered bones can be this beneficial to our internal health as well as our external beauty? It all begins with the high mineral content. Grass-fed beef bones contain essential minerals like calcium, magnesium, potassium, and phosphorus, all of which play a role in optimal health. Calcium is of course necessary for healthy bones, whereas magnesium plays a role in healthy metabolism, healthy bones, sound sleep, and nerve function. Potassium helps regulate electrolyte levels, and phosphorus works closely with calcium to promote strong teeth and bones. There’s an abundance of skin care products out there which promise to replete damaged skin with collagen, a protein responsible for giving skin its elasticity and youthful plumpness. When collagen breaks down, wrinkles are formed and skin begins to lose its young appearance. Many people turn to Botox to undo the apparent damage caused by stress, sun damage, and environmental and internal toxins. Little do they know that homemade bone broth is way cheaper and works its magic without a needle to the face. Glycine is a necessary protein the body requires to produce stomach acid and synthesizing certain antioxidants. When glycine is low, the body is unable to break down food fully and the undigested food may become forced up into the esophagus, commonly known as heartburn. Glycine also promotes detoxification by assisting the liver in removing the not-so-beneficial materials from the body. Glutamine assists in repairing the intestinal wall, which can be extremely beneficial to those who have leaky gut, but really it’s beneficial for all across the board. Basically no matter how much green juice and veggies we consume, if we have leaky gut or are unable to properly break down the nutrients in those foods, even superfoods, we never really reap the full reward of what we eat–because the barrier that’s supposed to keep food inside the gut isn’t sealed. Leaky gut allows molecules to seep into the bloodstream that aren’t supposed to be there. This, in turn, leads to a host of issues that create autoimmune reactions in the body, essentially causing it to attack itself. If reading this sparks the motivation to create your own bone broth at home, allow me to provide a few simple tips. Organic, grass-fed beef bones are crucial. I get bones from local farmers and also from the Rutland Co-Op. 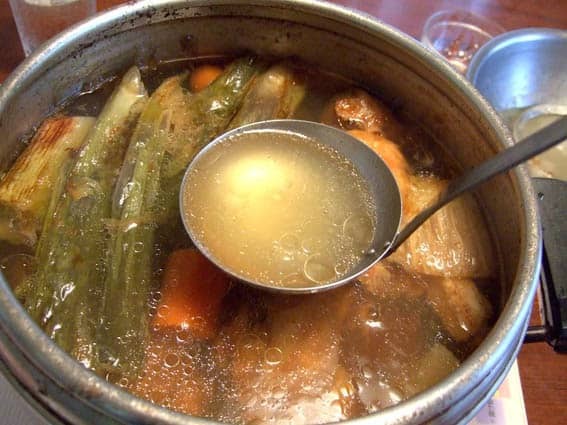 Your broth should consist half of marrow bones and half of joint and meat bones. This ensures that your broth will have a good mixture, creating the optimal amount of nutrients in your final product. I recommend using a slow cooker, but a large pot will also do. First, fill the slow cooker or pot three quarters to the top with bones–typically 3-4 pounds. Some people choose to roast the bones in the oven first for 15 minutes or so; this is simply to add flavor and is totally optional. You then want to cover the bones with water, filled almost to the top. Add 2-3 tablespoons of apple cider vinegar to the pot. The acidity of the vinegar will help pull the minerals out of the bones, allowing for a more potent broth. If you don’t have any apple cider vinegar, lemon juice will work as well. Next, let the pot simmer for at least 12 hours. I usually prepare my broth in the evening so that it’s ready the next morning. If you want to add vegetables, herbs, and spices, do so a couple of hours before the broth is done. There really is no over-cooking the broth–you can let it simmer up to 48 hours. Just make sure the pot is filled with water. After the time is up, pour the broth into a large bowl through a strainer to catch the bones and other pieces that you may not want in your broth. I uselarge glass containers to store my broth–one for the refrigerator and one for the freezer. Once chilled, the broth should gelatinize–that’s a strong indicator that you’ve got some potent broth on your hands. “Bone” appetite!